The Greenville Business & Professional Women’s Club held a scholarship competition. Pictured are (front row) Ashley Jolley, Elizabeth Watren, Jessica Meyer, Jenna Beatty, (back row) BPW member Brenda Miller, Macey Hartman, Kirsten Zink, Julia Mellot, Kiley Grilliot, Bridgett Filbrun, BPW member Vicki Cost and BPW member Sue Huston. Not pictured are Nicole Brocious, Rachel Unger, Rachel Lyons and Caitlyn Luthman. GREENVILLE – The Greenville Business & Professional Women’s Club’s March 14 meeting was hosted by the Scholarship Committee with Chair Kristi Strawser and committee members Brenda Miller, Sue Huston, Vicki Cost and Jennifer Bruns. The meeting was held at the Brethren Retirement Community Brick Room. The Scholarship Committee canvassed all eight Darke County high schools for applicants for the scholarship. Each of the finalists gave a three-minute presentation of their accomplishments and highlights through high school and shared their future goals. This was followed by an extemporaneous question. Brenda Miller introduced the finalists, who were Brigette Filbrun, Kirsten Zink and Nicole Brocious (Franklin Monroe); Kiley Grilliot (Ansonia); Jenna Beatty and Macey Hartman (Arcanum); Ashley Jolley and Rachel Unger (Greenville); Julia Mellott (Tri-Village) and Jessica Meyer, Caitlyn Luthman, Elizabeth Watren and Rachel Lyons (Versailles). The winners announced were Nicole Brocious, Kirsten Zink, Rachel Unger, Julia Mellot and Caitlyn Luthman. The five winners received scholarships in the amount of $750. Member Sue Huston, community connections coordinator for Darke County Development Disabilities, displayed some paintings drawn by adults with intellectual development disabilities. These paintings will be on display at the Merle Norman Studio located at 309 S. Broadway in downtown Greenville. Everyone is encouraged to take a look at the paintings. The Greenville BPW Club’s mission is to achieve equity for all women in the workplace through advocacy, education and information. 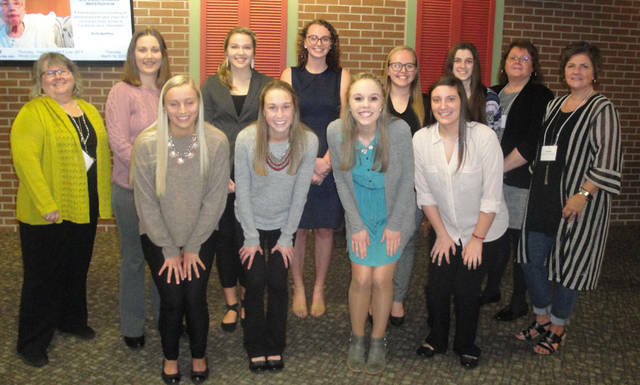 The club holds fundraisers throughout the year to raise money to grant scholarships to the young women of Darke County. The club meets the second Thursday of every month for a dinner meeting. Those interested in learning more about the club can contact Membership Chair Sonya Crist at 937-423-3657 or sonyacrist@gmail.com.